What’s the web inspector? The web inspector is a panel available in every current browser (yes, even IE!) that allows you to navigate through the components that go into rendering the web page you see. It also has a bunch of nifty features to help achieve better performance, find bugs, check mobile views, and more! How to open the web inspector — Mac Chrome: Cmd + Opt + I — Safari: Cmd + Opt + I — Firefox: Cmd + Opt + C — Internet Explorer/Edge: F12 Alternately, you can almost always open it via right- clicking and selecting “Inspect Element” from the context menu. Editing the code — Right click on elements on the page and select "inspect element" to get to that element directly in the "Elements" panel — Double click on text or an an attribute to edit its contents — Right click on a section and select "Edit as HTML"
Responsive testing capabilities — Change viewport size to known common resolutions — Imitate device type (e.g. if some content is only show to iOS users) — Use "touch" event rather than "click"
A brief aside about the Safari web inspector and its unique tools Safari is an Apple product, which means that it gets some special tools for working with iOS! When an iPhone/iPod Touch/iPad is connected via Bluetooth or USB to your computer, you can use the web inspector to look at the content of the browser on your phone. The iOS Simulator Apple also makes a simulator application that comes packaged with their coding suite called Xcode, which can imitate all Apple devices, from watch to iPad. Windows Testing Internet Explorer/Edge has slightly different tools for responsive device testing, which are under the "Emulation" tab. Internet Explorer/Edge can imitate other previous versions of IE, as well as emulate Windows phones. Application Storage The main use for this panel is to deal with cookies. Cookies are the way that sites temporarily store data about you and your choices in the browser. If you're in Safari or Firefox, you'll find this under the "Storage" tab. Examples of cookie usage: — User login — Online store shopping cart — Remember that user has closed a one-time notice You might want to clear cookies to reset a feature for testing, for example. Editing cookies In the list of cookies for the test webpage, look for one called username. Try double-clicking the value to edit it, change it to your own name, and refresh the page to see what happens! Audits Audits contains several automated tests that you can run on a website to check if it meets certain lists of criteria. For example, you can check Google’s performance scores and whether the site meets accessibility best practices from the inspector window, even if it’s a local site. Performance Audits For example, here’s a performance audit before setting up caching; obviously not a great score because we haven’t optimized the site yet. Network Throttling If a client has concerns about mobile performance, Chrome can "throttle" your network, which is to say pretend it's operating under worse conditions to test performance. 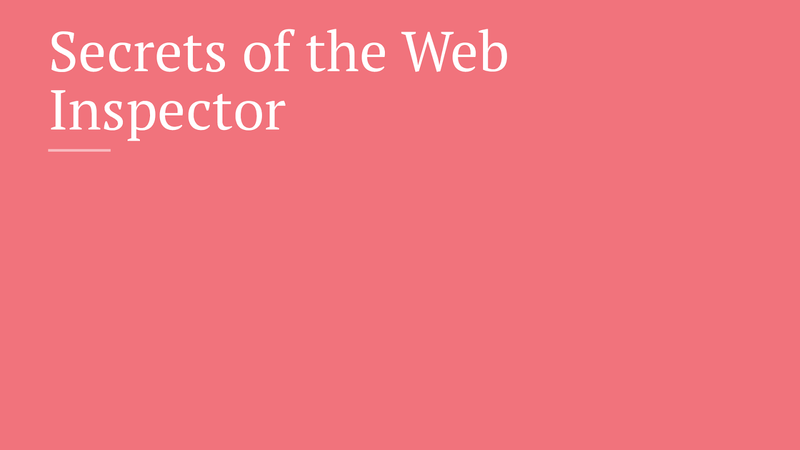 View Secrets of the Web Inspector on Notist. A brief overview of the many features of browser developer tools, with an emphasis on Chrome's web inspector. Learn about how to browse the source code, make on-the-fly edits, and discover optimization strategies right from the browser! Carly puts presentations on for free. You can too.